The nation is only beginning to grapple with the full extent of devastation wreaked by Hurricane Maria — a Harvard report published Tuesday found the death count to be an estimated 4,645 people, and around 14,500 Puerto Ricans are still without power even as a new hurricane season begins this week. 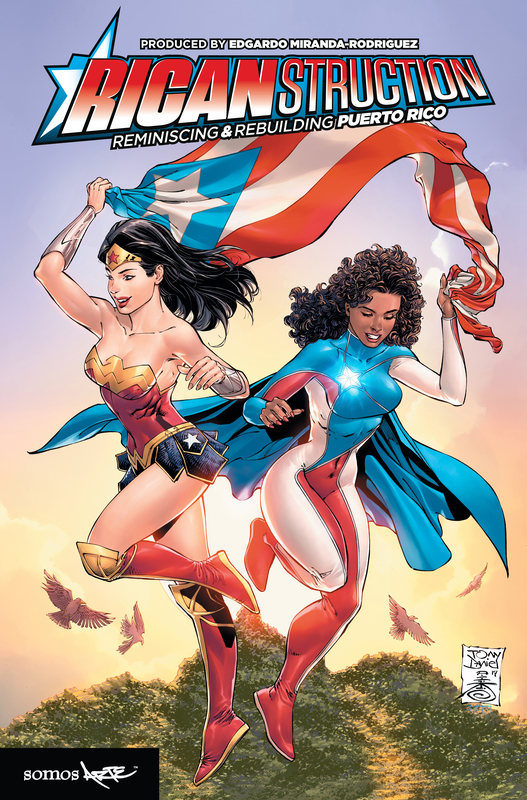 Now more than ever, the island is in need of superheroes, and what 'Nuyorican' art director and comic book producer Edgardo Miranda-Rodriguez hopes is that La Borinqueña, the Puerto Rican superhero he created in 2016, and her supporting cast in his recently published anthology “Ricanstruction: Reminiscing and Rebuilding Puerto Rico,” can uplift Puerto Rico while also highlighting and supporting the work that real-life heroes are already doing to rebuild the U.S. territory. 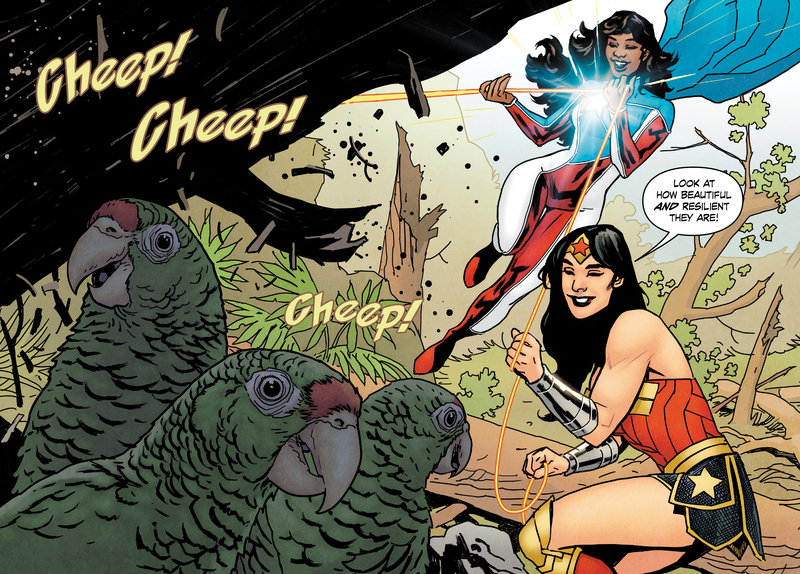 The book, produced by Miranda-Rodriguez and his studio Somos Arte, created with DC Comics characters used with their permission, has already been a hit with Puerto Ricans and non-Puerto Ricans alike, ranking as a number one bestseller on Amazon for the past two months, with 20,000 books pre-sold before the release date, and international reception stretching as far as Australia, London, Paris, Chile, and parts of Asia. The anthology was first made available in local bookstores several weeks ago and is available this week in Barnes and Noble, Amazon, and bookstores across the country. 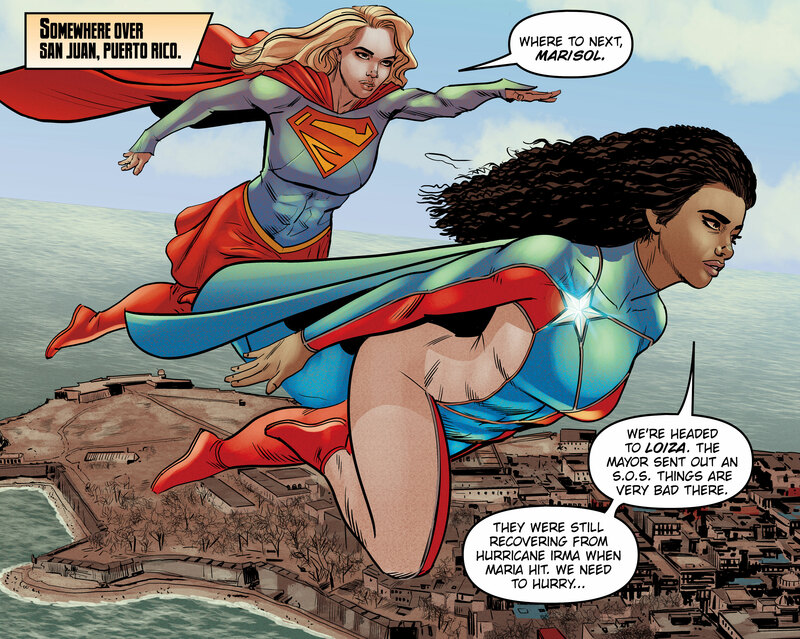 In showing a Puerto Rican superhero and bringing established characters like Batman, Wonder Woman, and Aquaman to the island, Miranda-Rodriguez said the anthology sends a message. For Miranda-Rodriguez, the response this month when he debuted the book at Cómic Con in San Juan, Puerto Rico, was overwhelming. The project first began in a moment of crisis, far away from the island, as Puerto Ricans abroad coped with the aftermath of Maria from and awaited news from their family. Miranda-Rodriguez, who lives and works in Brooklyn, NY, said that the seeds of the project began at Comic-Con 2017 in New York, which took place just a few weeks after Maria. Like many Puerto Ricans, Miranda-Rodriguez wasn’t able to connect with his family on the island for several weeks after Hurricane Maria hit and was left to worry and wait. “It just felt as if 3 million people were wiped off the planet. Because there was no one that I knew that had heard from anyone, and this was just two weeks after Hurricane Maria,” Miranda-Rodriguez said. That weekend, his table became a “safe haven” for Puerto Ricans and anyone with connections to the island, as many gathered to cry, discuss their fears and concerns, and share their hopes about Miranda-Rodriguez’s work: the intrepid La Borinqueña, the Afro-Puerto Rican young woman who studies Earth and Environmental Sciences at Columbia University and who is transformed into a superhero by a Taino goddess. The character had just been announced the prior summer at the National Puerto Rican Day Parade. The answer was to do what Miranda-Rodriguez and the rest of the creators gathered there that day do best: conceive stories, illustrate, and make a comic book. What started as a momentary idea fast became a full-fledged anthology and collaboration thanks to Miranda-Rodriguez’s expertise and dedication in pulling together the work of about 150 contributors for the anthology, including recognized creators in the comic book industry as well as other celebrities such as Rubén Blades, Esmeralda Santiago, Sonia Manzano, Rosario Dawson, and others. 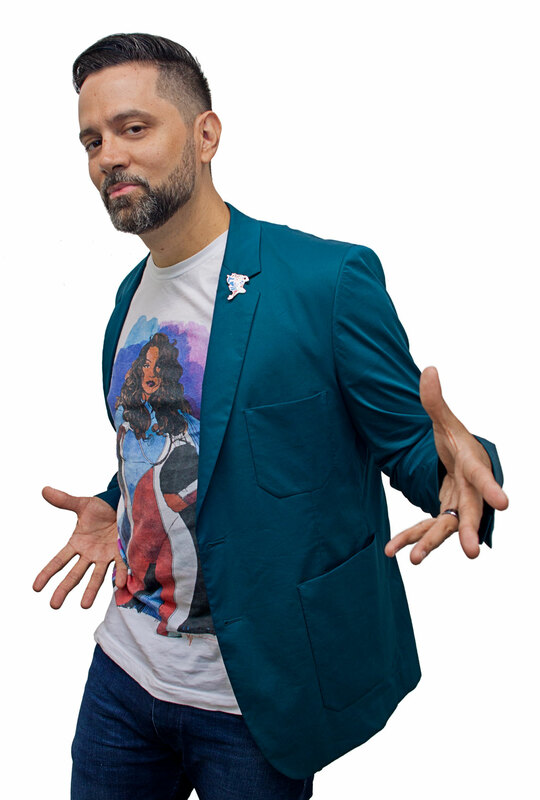 Tony Daniel, a high-profile comic book creator and also Puerto Rican, committed to creating the cover of the anthology, which would feature La Borinqueña and one DC Comics character. At the suggestion of Kyung Jeon-Miranda, Miranda-Rodriguez’s wife and a fine artist in Brooklyn, Wonder Woman was chosen as the character to be presented on the cover alongside La Borinqueña. “Wonder Woman is an icon that’s been around for over 70 years now, and she’s recognized internationally, and here we have La Borinqueña, who’s only been around for two years now, but she represents a people that have a history of being colonized, that have a history of being oppressed, that have a history in the face of all of that of being resilient,” said Miranda-Rodriguez. The proceeds from the anthology will go to various organizations currently doing work on the island, an effort which will be organized by Jeon-Miranda and Nicole Rodriguez, a friend of the couple, aiming to “bring awareness to the work that’s happening on the island, and debunk this myth that puertorriqueños are just looking for a handout,” said Miranda-Rodriguez. The organizations selected for the funds will be announced on Sept. 23, Miranda-Rodriguez said, just three days after the one-year anniversary of Hurricane Maria on the 150th anniversary of Grito de Lares, which was the only successful uprising in the history of Puerto Rico, at that time against the Spanish colonialist empire. The funds will then be distributed in an event hosted by San Juan Mayor Carmen Yulín Cruz Soto on Oct. 13. “It’s an opportunity to really take the heroism out of the comic book and actually bring it into the real world,” he affirmed. Something that La Borinqueña herself has been accomplishing, even before the hurricane. Since her creation, the character of La Borinqueña, or Marisol Rios de la Luz, has resonated deeply with many people. “It was an opportunity to create a character that would tap into the formula of what attracts us to popular culture, and use that in a subversive manner to really get people to become aware of what was happening in Puerto Rico, this humanitarian crisis that was affecting three million people as a result of this debt crisis,” said Miranda-Rodriguez, referring to the financial crisis the island has experienced since 2015, when the governor announced that the Puerto Rican government would be unable to pay the approximately $70 billion debt. Miranda-Rodriguez’s love of comics dates back to his childhood, growing up as an introverted kid in the South Bronx, where he lived with his single mother. They struggled to make ends meet economically, living off of public assistance. “Intimidated by the streets,” Miranda-Rodriguez would often stay indoors at home, reading comics, drawing comics, bringing his original comics to school to sell them to friends to make money to buy more comics. He even walked the streets of the city at night with his dog to collect bottles and cans so that he could save up enough money to fuel his comic habit. For 30 years, Miranda-Rodriguez stepped away from comic books to develop his career as an art director, not getting back into actually making comics until his late 40s. He curated several shows for Marvel Comics, including one in 2009 which highlighted superheroes of color that had been created in the company’s history. La Borinqueña was his first independent project, and it struck a chord. “There was just such an absence, a void, and the work that I was doing immediately addressed and filled that void. You know for the most part studios and the same goes for major publishers, they fall very very behind on being on the cutting edge of developing projects that really speak to what is topical,” said Miranda-Rodriguez. “What they didn’t anticipate was the global impact that it had, and continues to have,” he added, noting the immediate positive reception and speaking engagements that flooded in after the announcement of the character in May 2016, before the first edition of a book was published in December. Would Miranda-Rodriguez like to see La Borinqueña on the silver screen? “My whole goal of making this art is to inspire and to bring prosperity to Puerto Ricans,” he said.